Cancer has become the leading cause of death worldwide, especially in developing countries that account for 70% of the world’s cancer deaths. 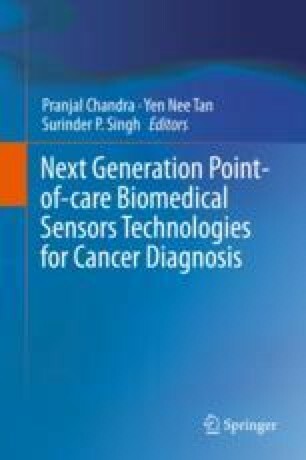 Early diagnosis of cancer can help reduce the cancer mortality, and burdens can be reduced if low-cost assays are developed and utilized. In this chapter, we presented recent works on label-free and ultrasensitive detections of cancer biomarkers for low-cost early diagnosis of cancers based on G-quadruplex and isothermal amplification. We firstly explained the concept of “label-free biosensor”, and then introduced the property and serviceability of G-quadruplex in label-free biosensors. After a brief description of the advantages of isothermal amplification, recent reported works based on G-quadruplex and isothermal amplification were illustrated and classified by types of targets including gene mutation, microRNA, enzyme activity, protein and small molecule. Finally, conclusion and perspective were made that the employment of ratiometric detection and DNA logic gates would promote the cancer diagnosis in a more reliable, cost-saving and time-saving way.